There has been a lot of conversation in the market recently around chatbots – what their impact will be on customer experience, on agents, and on employees. And while no one really knows what the future holds, I can say confidently that both humans and their AI-powered counterparts perform best when they work harmoniously together. What does that exactly mean? We recently co-hosted a webinar with John Ragsdale from TSIA to discuss this topic. TSIA regularly surveys their members to create benchmarks, spot technology trends, and discover interesting use cases. In a recent survey, TSIA found that over 50% of their respondents plan to spend money this year on chatbots for customer self-service. With so many companies looking to bring AI into their customer journey, where do the humans fit in and how do they work with these bots to achieve better outcomes for customers? First and foremost, no matter how much the customer journey is moving toward AI, human agents still have a very important role to play. Today’s chatbots assist human agents by taking low-level queries off their plate, or by providing them with information about a customer’s situation in the back-end. By freeing human agents to take on complex issues requiring empathy and nuanced understanding, bots help agents do what they do best – be human. To successfully utilize AI for customer engagement, you must first determine the value of your various customer interactions. You can then determine which interactions should be AI-led or agent-assisted. For AI chatbots to handle customer interactions effectively, they must first understand customer intent. One of the biggest challenges for AI is understanding intent within the context of natural language. For example, three different users will almost undoubtedly ask the same question a bit differently. From a machine’s point of view, these three statements are very different. But a human understands that the intentions are all the same thing: to successfully log in to the system. For chatbots to be effective, you have to teach them how to extract intent. With defined intents, you can determine which queries are most valuable to your business and should be handled by a human agent, and which queries are routine and easy enough for a bot to handle. TIP: Define high and low interactions for your business to assess where and how you can best use AI technology to deliver better customer outcomes. Make sure the technology you choose can accurately decipher customer intent so that customer interactions can be routed to the right agents and channels at the right time. Keeping a content knowledge base current, relevant, and updated is a burden for most organizations. But AI makes it easier to know what content is most relevant to your customers. By compiling data across thousands of interactions and showcasing unanswered questions in a dashboard, AI makes it so much simpler for companies to manage their content. Further, when bots and agents work together in one system, the AI learns from humans when it doesn’t know the answers. TIP: Don’t forget to train your employees on how they can leverage AI to build your best knowledge base. Every business knows that keeping happy customers is a top priority for overall success. So, giving customers what they need, when they need it, with minimal friction is paramount to long-term growth. And while research clearly shows that today’s customers are asking for self-service through AI, getting the balance right between self-service and agent-assisted service is key to creating the happiest customers. TIP: Make this customer-first mantra part of the company culture, so it’s always top of mind. 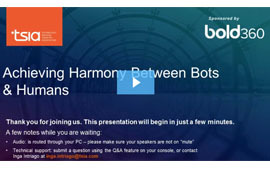 Want to hear more about how bots and humans work best together in harmony? Check out the recorded webinar here.